Halloween is one of my favorite times of year to sew for! It's all about creativity and having fun. Go dark and bold or sweet and fancy, you can't go wrong. I'm not sure what I'll be this year for Halloween but I have several base items to start with like this no sew DIY cloak gown here and DIY corset here. 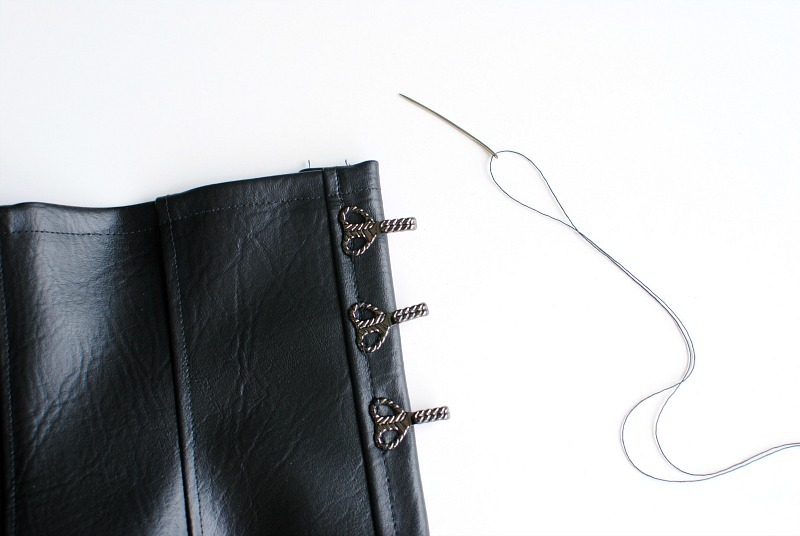 I've shown you how to make a simple corset using Dritz Eyelet tools and it was a hit. 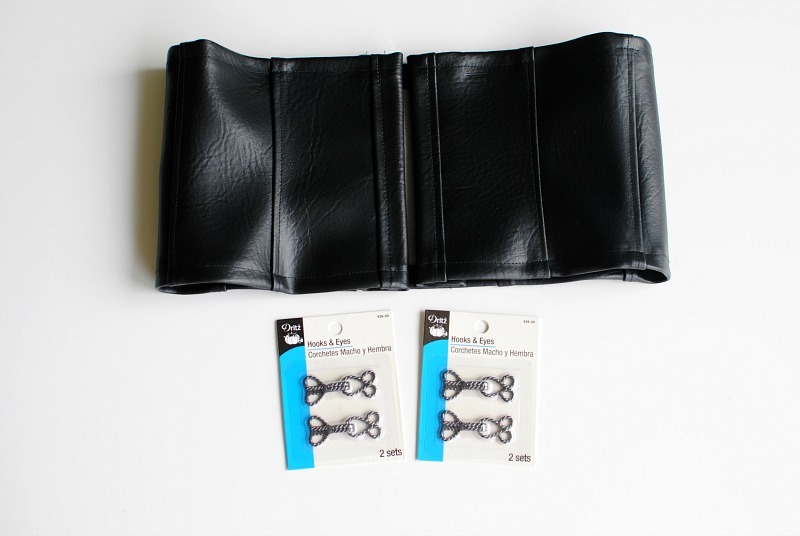 One of Dritz's new products are these metal Hook & Eyes that I've been wanting to add to a corset. They have a steampunk/vintage look which is great for costumes and easy to apply. I even used my button sewing foot and button stitch and it was the fastest application ever! You can wear this over a dress shirt or loose blouse for ready-to-wear. Get the details below on how to make this corset just in time for your Halloween Costume! Begin by making your corset with the tutorial above. 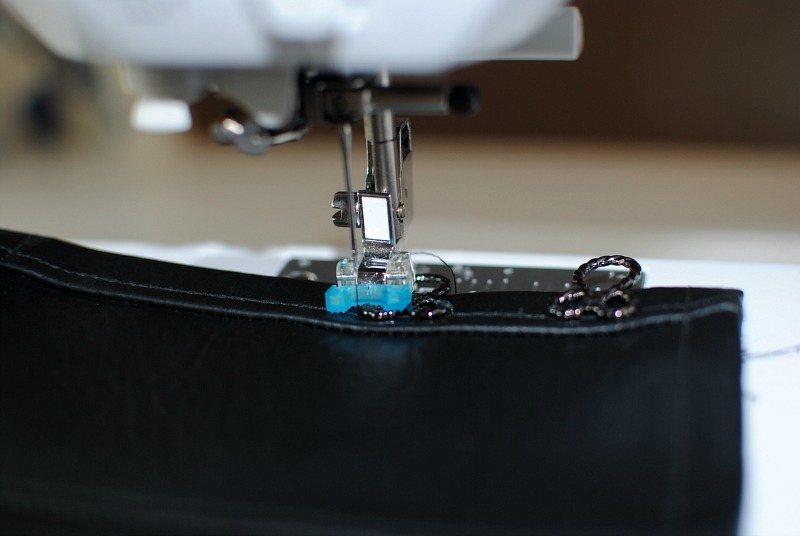 Place the hook and eyes evenly along the center front and mark on the corset for placement. I spaced mine about 1" apart. You can hand sew them on at this point. I wanted mine to be secure since it's a corset and it would be a lot of hand sewing so I used my button sewing foot and button stitch and stitched through each loop this way. It made it a lot faster and more secure. Just make sure you adjust the width properly before sewing. 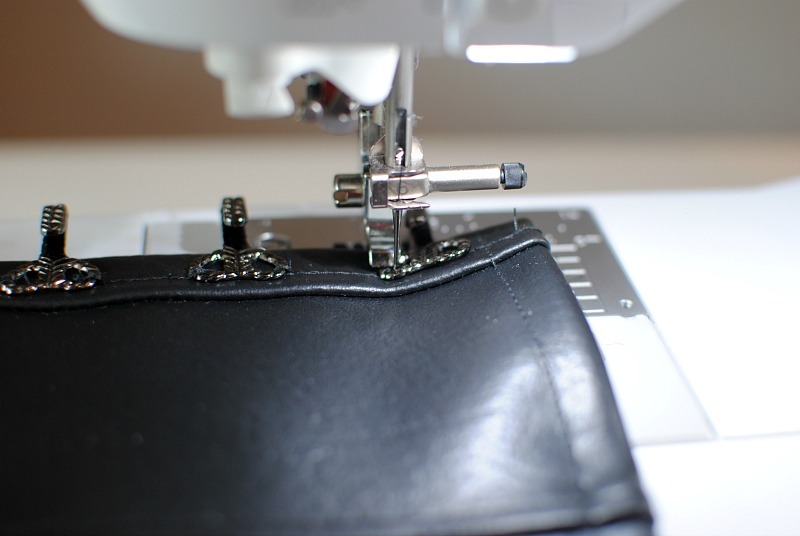 If you don't have a button sewing foot or button stitch then just use your machine without the foot and a zigzag stitch with no length. Make sure to drop your feed dogs as well. For the hook side I did remove the foot or I couldn't drop my presser foot to complete the stitch. So I used the shank over the hook loop and repeated the button stitch. That's it. I love the way these look and can't wait to try them out on other projects! I like that belt of yours, look it very beautiful, I want to try it but I do not know where to buy the material, can you help me? What a great DIY! I'm thinking about buying a corset belt, now I will DIY it! Thank you for sharing the tutorial! What a great DIY! I'm thinking about buying a corset belt, now I will DIY it! and i love it so much Thank you for sharing the tutorial! and if you can visit on my site that so sweet please come and read my article and i know you really loved it. It is a great article thank you share with us this information. Students Assignment Help serves the best assignment writing UK services by the professional and high qualified assignment writers from the universities of UK, Singapore, and USA. We offer the reliable assignment writing services to the students. There are no barriers with borders. We provide Java assignment helpto the students based in Australia, the UK, New Zealand and the US. Also, writing a program using C, C++, C#, Python, Ruby, and JavaFX is not a challenging task for our experts. Are you worried about how to do assignments? Why to worry when you have a cheap custom assignment writing service providing you with all sort of online assignment help in Australia? Now do accounting assignment help and law assignment help in a minute! Enroll now at GoAssignmentHelp. If you need Assignment help expert from professional experts then, come at SingapreAssignmentHelp.com. We have native English speakers from USA, UK, Australia, Ireland, Singapore, etc, in our team. I would like to thanks for sharing the high-value blog with us.The attitudes of the employees as the job satisfaction are two of the curial points which provide the huge impact on the organizational behavior. This literature review will help in explaining the desired relationship between the attitudes and job satisfaction with that of the organizational behavior. Students Assignment Help holds the dedicated team of professional writers providing services for writing assignments to the students. Our writing helps experts have enough knowledge and understanding to assist students. Our Writes are highly educated from the top universities around the world. the value of providing a quality resource for free. No doubt this is an excellent post I got a lot of knowledge after reading good luck. A theme of the post is excellent there is almost everything to read, Brilliant post. Clear your doubts using PayPal support number, while facing problem with your PayPal account.